Traveling to Disneyland with Toddlers – Tips To Make The Most Of Your Trip! Being at the Disneyland Resort is always filled with magic, no matter what stage of life you decide to go. Both young and old alike create wonderful memories that will last a lifetime. However, if you’re worried about bringing a toddler to Disneyland, don’t fret. 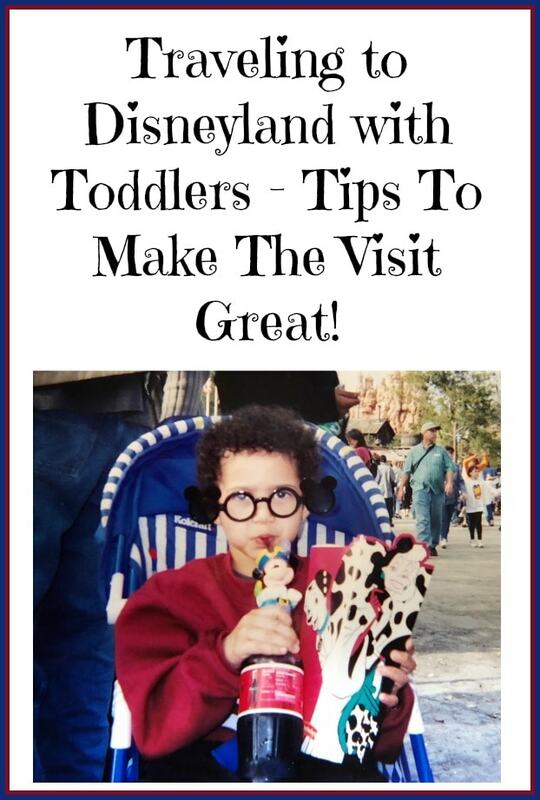 I’ve teamed up with my friends at Get Away Today to give you the best tips for taking a vacation with toddlers to Disneyland. Even in the midst of tantrums and height restrictions, the Disneyland Resort can truly be “The Happiest Place on Earth” with your little one. Keep reading to find out how you can make your next vacation with your future prince or princess the best one yet. Disneyland has two areas, that are particularly friendly for younger kids. Those are Mickeys ToonTown and Fantasyland. Both of these areas will have many attractions geared at younger kids. The drawback to both of these areas, is that they can get crowded. Over in the California Adventure, Bugs Land is geared towards the younger crowd (and was my youngest daughters favorite area for years!). It is slated to be replaced in 2020, so check it out with your little ones before its gone. This area often has smaller crowds, and there are spray areas for little ones to cool off at – so we really liked this area with younger kids. Plus it includes a 3-d movie area if you just need to get out of the sun and rest in an air conditioned area for a bit. In addition to those areas, here are some other ride recommendations, as well as other tips for traveling with toddlers. 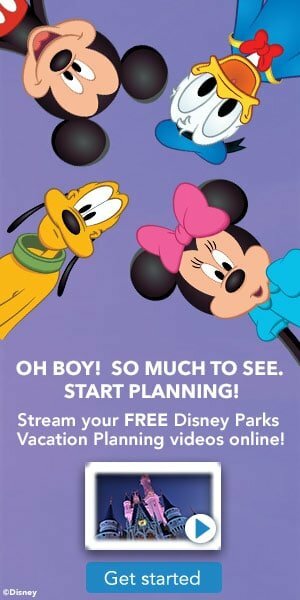 Be sure to check out general tips for planning your Disneyland trip too, to make the most out of your visit. others. Just because a ride is in Fantasyland, doesn’t mean it will be a “Happily Ever After” for your little one. Because of this, I’ve listed all of the scare-proof attractions for toddlers in both Disneyland and Disney California Adventure that kids of all ages are sure to enjoy. 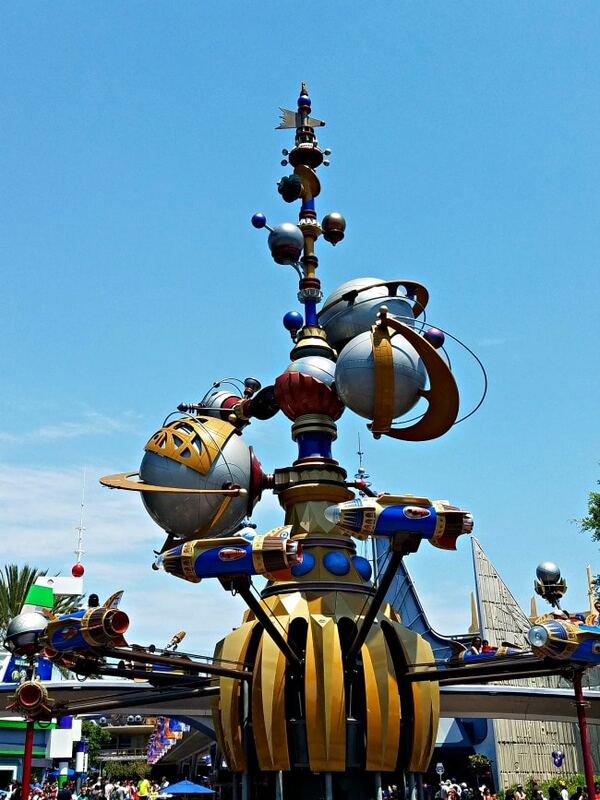 Astro Orbitor: Located in Tomorrowland, you’ll find the iconic attraction greeting you into a futuristic world. Here, you can grab your toddler and take flight as you soar around space. The best part? This attraction lets you control how high or low you go, so you can stay close to the ground if your toddler is afraid of heights. No matter how you decide to fly, your little astronaut will love this ride! Peter Pan’s Flight: Peter Pan’s Flight is one of the most popular attractions at the Disneyland Resort and for a good reason. This classic tale comes to life as you soar over London and Neverland with Peter, Wendy, Tinkerbell and the gang. This gentle ride will leave toddlers in awe of the bright colors, fun music and whimsical theme. Although this attraction seems to have a longer wait time than most, this ride is well worth the wait. “it’s a small world”: “it’s a small world” is a Disneyland classic that your own small one will absolutely love. In this calm boat ride, you’ll be able to travel around the world and find out that we’re not so different after all. 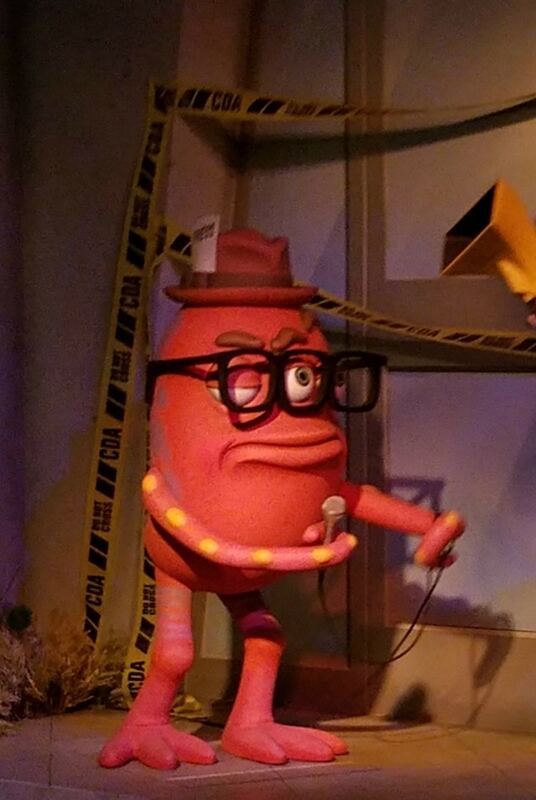 Whether your toddler lives in a world of laughter or a world of tears, they’re sure to love this adorable attraction. Mad Tea Party: You’re little one certainly won’t be mad after riding on this kid-friendly attraction. Here, you can hop in a colorful teacup and take it for a spin. In addition to the bright colors and catchy music, kids will love being able to control how fast or slow the teacup moves. This is also a perfect spot to snap a candid picture of your little one too! Finding Nemo Submarine Voyage: Take a journey under the sea in Finding Nemo Submarine Voyage with your toddler. Everyone will love being able to explore the ocean with Nemo and his friends. Whether your child loves the ocean or just loves the beloved Pixar film, they are sure to enjoy this undersea adventure. The Many Adventures of Winnie the Pooh: Over in Critter Country, in the back corner of the park, is this Winnie the Pooh ride. Its another one that often has a small line and is easy to get on. 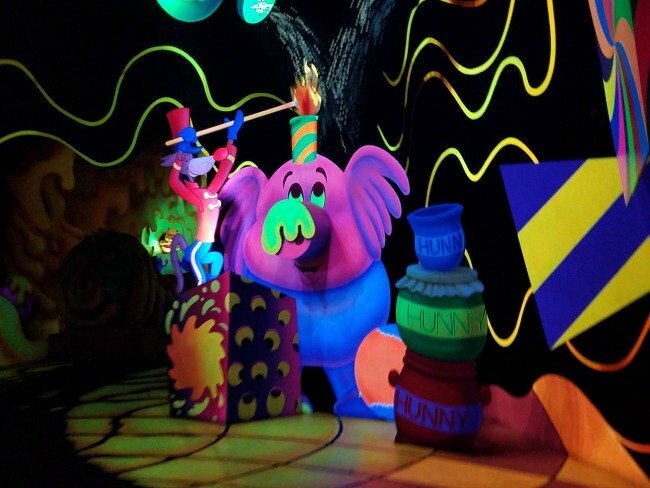 There are lots of colors, and neon ones at that, but little ones often love Winnie and the gang! Monsters Inc. Mikey & Sulley to the Rescue! On this attraction, you and your little one will get to team up with Mike and Sulley as they try to save Boo from Randall. You’ll be able to take a mild ride through Monstropolis and see famous scenes come to life from Monsters Inc. Although this adventure is monstrous, your little one will only scream of laughter and delight. 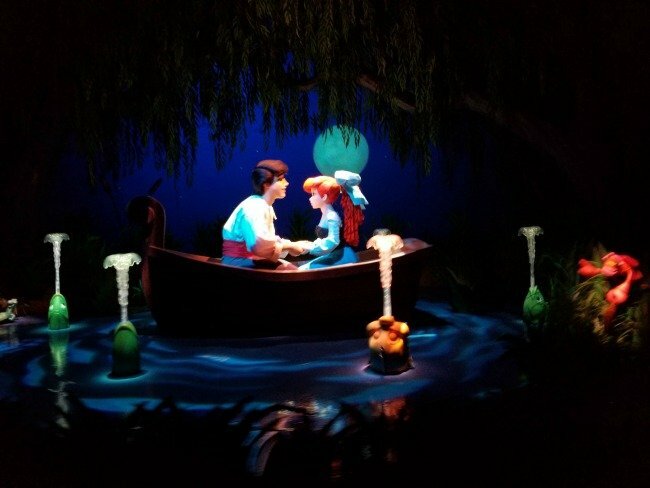 The Little Mermaid – Ariel’s Undersea Adventure – On The Little Mermaid – Ariel’s Undersea Adventure, you’ll be able to be part of Ariel’s world as you see the story play out right before your eyes. With memorable tunes from the classic film, you can sing along as you travel through the beloved story in a colorful seashell. Not only is this the perfect ride to choose on a hot summer day, but there is typically a non-existent line. Toy Story Mania – You’ve got a friend in Buzz, Woody and the rest of your favorite toys at Toy Story Mania. You and your little one can play 3D games together to see who can get the highest score. Even if they’re not old enough to actually play, they’ll still love the bright visuals and fun appearances from their Toy Story pals. Redwood Creek Challenge Trail: This is in the Grizzly Peak area (near the private entrance for the Grand California Lodge), and is a nice place to take a break from the lines with the kids by letting the run around a bit, and enjoy some of the tunnels, and play structure here. In addition to meeting characters and getting autograph books signed, there are some wonderful shows that your little one will love. Keep reading to find out the best entertainment that toddlers will enjoy, in addition to the fan-favorite parades and firework shows. Frozen – Live at the Hyperion: Whether you’re a Frozen fan or you’re ready to “Let it Go,” Frozen – Live at the Hyperion is a show that everyone will enjoy. This Broadway-style show is located at the end of Hollywood Blvd. and is a condensed version of the cherished movie, but still includes all of your little one’s favorite songs and scenes. Because this musical is about an hour long, this is the perfect way to take a small break in the middle of they day. Disney Junior Dance Party: Also located in Disney California Adventure is the Disney Junior Dance Party! In Hollywood Land, your toddler can dance, shake and sing with their favorite Disney Junior Characters. They’ll be able to see Sofia the First, Doc McStuffins, Timon and even Mickey Mouse! This show runs multiple times throughout the day and is only about 20 minutes long, so make sure you head on over if you’re close by. 1-Park per Day tickets: Although Toddlers seem to have more energy than anyone else, they can also tire out very easily. Because of this, I would stick to a 1-Park per Day ticket when you travel to the Disneyland Resort. This way, you’ll be able to experience everything that each park has to offer, without traveling back and forth. Plus, Get Away Today offers great discounts on 1-Park per Day tickets, so you’ll also be getting the best price on your next trip to The Happiest Place on Earth. Stay Close: Speaking of getting tired, it’s always helpful to stay at a hotel nearby the resort. Sometimes toddlers (and adults) need a break from all of the fun, so it’s great to just be a hop, skip and jump away from a well-deserved nap. Plus, it’s always great if you’re looking to make a splash at the pool while you’re there! Bring Snacks: While the snacks at Disneyland are delicious, sometimes they aren’t the most nutritious. To avoid buying sugary treats like churros and Dole Whips, I would recommend bringing in snacks of your own. Water, fruit snacks, granola bars and chips are all great options to keep you and your little one hydrated and full throughout the day. Since this will save you some money, you can use that cash towards a special experience like Character Dining! create will be ones you cherish forever. If you haven’t booked your next Disneyland vacation, make sure you use Get Away Today. With discount Disneyland tickets, hotel specials and a flexible Layaway Plan, they are the top Southern California vacation provider for a reason. Book now at getawaytoday.com or call 855-GET-AWAY to speak to a travel expert directly. Plus when you mention promo code ThriftyNW, you’ll be able to save an additional $10 off your vacation package. Let them know that Thrifty Northwest Mom sent you!